In our previous post, we looked at “how” we decided to pay for the boat. In this post we’ll cover “what” we paid, and we’ll try and cover all the expenses and administrative paperwork required for us to be able to move on our boat following our closing date of October 19, 2017. The costs beyond just the purchase price can be subtle so they are something to pay attention to. Years ago, while we were still in the habit of buying houses every 2-3 years while hopping across the country, we developed a rule of thumb that said whenever we are buying a big ticket item, like a house, cottage, boat, etc. we will add 20% onto what ever price we decide to pay. This was a lazy-man’s way of accounting for upgrades, maintenance, or the inevitable surprises from things we either forgot or didn’t know were required. The purchase price is the obvious target for most people when looking to buy a boat, but for vessels as complex as large cruising sailboats have become, there is some due diligence, and additional expense to consider before worrying about an agreed purchase price. As in previous posts, all figures will be in US dollars. The first boat that we put an offer on was a 2013 Leopard 44, based at Village Cay in Tortola BVI. We decided to use a broker for this purchase, but this did not cost us anything. Similar to most real estate transactions, the listing agent normally shares the commission with the buyer’s agent (our broker) so it doesn’t cost anything to use a broker to purchase, only if you use one to sell. At the time, we were in Ottawa, so we had to fly down to Village Cay in the British Virgin Islands for our initial inspection, and if we liked what we saw, we had already arranged for a haul out, survey and sea trial. 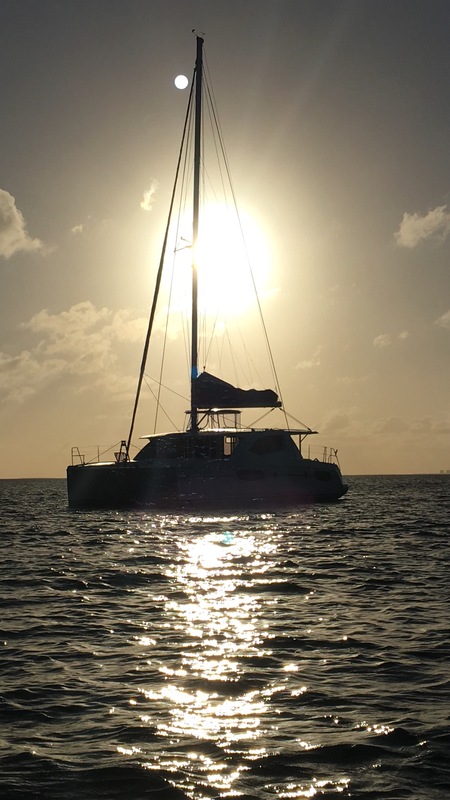 We had also sat down with Kent, the owner of Just Catamarans to discuss some of the work we would like to have done on the boat if we bought it. This came to about $25,000 as a rough estimate after talking to Kent for an afternoon. He was very patient with our questions and the (obvious) fact that this was our first big boat and we were still figuring things out as we went. He had a major role in our ability to financially and emotionally invest in what can be an intimidating journey. After all the travel and services used in Tortola, for a difference of $9000 with the seller, we walked away from our offer to purchase*. We consider our expenses here to be plane tickets, hotel rooms, haul out, survey/sea-trial, ferry ride (USVI to Tortola X 2), but not meals as we would have to eat wherever we were. We wrote a bit about that survey/sea-trial experience here. 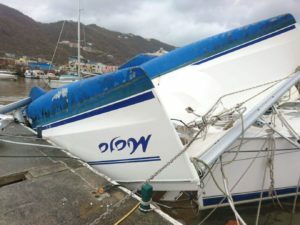 *As an interesting note, a couple weeks after we walked away from this boat, Hurricane Irma devastated the BVI and sadly the boat ended up like this. Another couple had got an accepted offer, sold their home and were packed up ready to move aboard when this happened. We were happy to hear they found another boat soon after. To clarify what you’re looking at, that’s the hull of a 30,000 lb catamaran, upside-down on top of another boat, on the opposite side of the concrete dock from where it had been secured with 6 chains. Hurricane Irma’s destruction was truly impressive. So far we had incurred $6000 in expenses and had nothing tangible to show for it, but we did have the experience invested in the process up to now and better understood what to expect during a boat survey and sea-trial. While we were frustrated at the result, at the same time we were happy with our ability to walk away from a boat that was not right for us. We also recognized we were willing to spend more money on a better boat, or one that offered us more “value” rather than simply the best price. We put that experience to good work for our next offer to purchase on the boat we ended up owning. It was listed for $479,000 in Key Largo and happened to be headed to Just Catamarans in Ft Lauderdale for some work, so after our agreed purchase price of $465,000 we would be able to see it and arrange for a survey/sea-trial at the same time. Of course that would require more travel including plane tickets, Airbnb and a rental car. Based on on our research, we had budgeted about $3000 for a haul out, survey and sea trial. On our first one in BVI, it cost around half of that. From that experience, for the next one we arranged for a full exterior and interior inspection, all working machinery, electrical systems, sea trial, rigging, sails, oil sample analysis of the engines, saildrives, and generator, and market and replacement values for this vessel for $1,250.00. This very detailed survey lasted from 0800-2000hrs. The haul out fee was about $700. We were happy with the general condition of the boat, and it was evident it had been well maintained. However we were shocked to learn that some key features that were advertised didn’t exist! We almost walked away from this one as well, wanting to tell the owner’s broker to shove it for advertising a boat with radar (among other items) when it doesn’t have it. It came down to the fact that there really were no other boats that we liked available, and we knew there were 2 other offers on this boat waiting for our decision. In the end, the selling broker acknowledged his errors and gave up $8000 from his commission, so we saved that amount on the purchase price. We had done quite a lot of research into insurance, as I was leery of underwriters in general from various stories of people that found out what was not covered on their policy only after an incident. If you want to learn more about our research and choices on an underwriter, you can read a bit about it here with a followup here. With our decision to carry a mortgage on some of the value of the boat, and register it in Canada, there were some regulatory requirements and increased paperwork as a result. 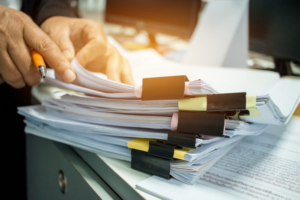 While we likely could have fumbled our way through them on our own, we figured we had enough to worry about already, so we decided to hire a “paperwork guy” to look after it for us, also known as a document agent. Some of the paperwork he took care of includes: ensuring the purchase contract meets Transport Canada requirements, removing the vessel from the US Coast Guard registry of vessels, registering the vessel with the Transport Canada (TC) registry of vessels, registering the vessel with the TC registry of vessels with a mortgage, registering the dinghy, verifying the bank mortgage paperwork met TC requirements, escrow services during the purchase, currency exchange for purchase in the US funds, plus a few other items. Well worth the money for the headaches it saved us going through it all for the first time. 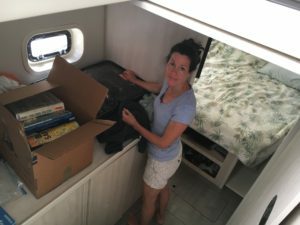 Since Christa was still working, and our household was in Ottawa ON with the boat in Key Largo FL, that created a fair bit of complicated planning to get ourselves established on the boat. 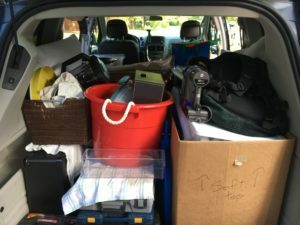 I rented a mini-van for $900 and loaded what we wanted to take with us on the boat and headed south with $150 in gas. There were a couple nights in hotels on the way down and then at the marina while waiting to close, for $600. Christa spent $600 to fly down for the weekend of the closing and then back to clear out of work. I then had to drive the mini-van back to Ottawa for $150 of gas, fly back down to FL at $400 and then Christa flew back down for the last time for $400. On November 26, 2017, Christa met me in Florida on the boat. We enjoyed our first night of what was to be a long eventful journey, while silently wondering what the hell we just did by spending $457,000 for something that we thought would depreciate at 5-8% per year (we’ll cover this later). Plus, for the privilege of this purchase price, we had also spent an additional $20,500. Since this was only about 5% of our rule of thumb for an additional 20% that we add onto the cost of any major purchase, we should be doing fine…right?! The next post will be about boat upgrades where we’ll focus on our boat yard work plan & budget vs the reality of what we actually did. This is where we really start to bite into that additional 20%.